The GDC has learned of an instance of political policing of a different kind that took place in Newcastle at the weekend. 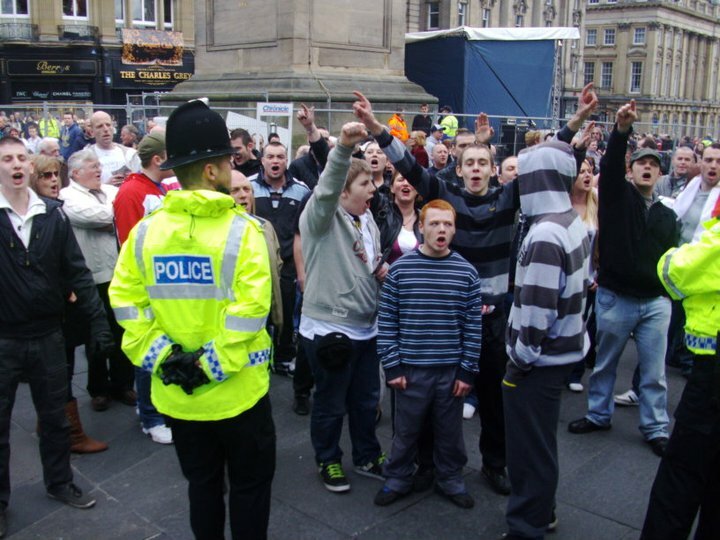 Fascist thugs from the English Defence League turned up at the Monument in Newcastle city centre to disrupt stalls organised by Fight Racism! Fight Imperialism!, Tyneside Campaign against Racism!, and the Socialist Party. Anti- cuts campaigners fighting for services and jobs heard the unemployed abused as scroungers by the EDL and asylum seekers and Muslims were also racially abused and intimidated. The response of the police was to fold their arms and let all this take place without warnings or intervention. A very different approach to the way protesters against the system have been treated, in Glasgow, Newcastle and London. This GDC site has ample evidence of this. We know the cops are organised and paid to protect the powerful and wealthy and to disrupt, assault, intimidate and criminalise opposition. Where they can't do this, their fascist mates- the bootboys for British bankers and British imperialism- are allowed to get on with the dirty jobs while a blind eye is turned. A new pamphlet from Fight Racism! Fight Imperialism! Looks at some of the lessons so far from the beginning of the battle against the cuts. Called “No cuts- Full stop! Capitalist crisis and the public sector debt” available at www.revolutionarycommunist.org, it contains a section on the specific lessons of political policing drawn from our recent experiences. Govanhill, Glasgow was the working class community where last summer comrades went out to campaign against the cuts and straight away came up against the police who were determined to limit and crush democratic rights if necessary. The fascist EDL are no different. They want the streets free of opposition to the attack on welfare and jobs and free of working class organisation so that their millionaire masters' budget can be pushed through. The Glasgow Defence Campaign calls for unity to defend the right to organise and protest against police and fascist threats. NO TO THE BANKERS' BOOTBOYS! Victory for the Glasgow Defence Campaign!